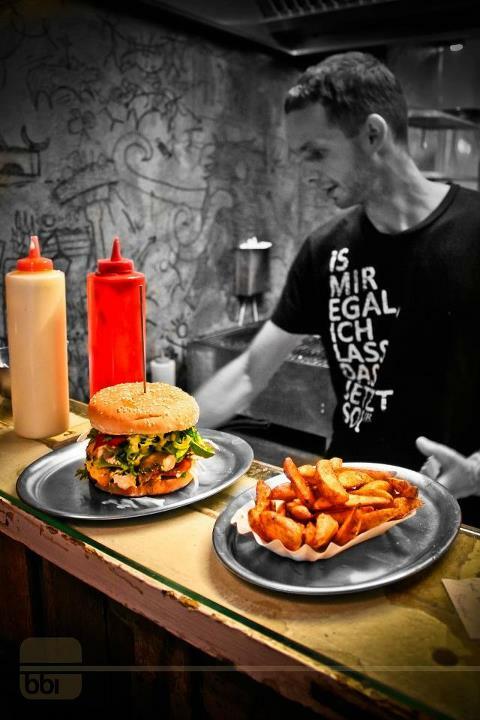 BBI Berlin Burger International, an abbreviation for the Neukölln located burger hot spot, is a small Burger Factory which offers a variety of homemade treats for the hungry city dwellers. With the utmost care and the necessary passion, BBI, devote themselves entirely to pleasure. The place is famous for serving the best organic burgers, hand-cut potato wedges and fresh salads. Also the burgers come with home made sauces. Sometimes, the cooks use a little too much sauce, so you can specify that you want your burger to be less saucy. The prices are a bit high, for Berliners at least. The average bio burger with fries and a salad is between 12-13 EUR. Of curse, there is a cheaper option of the non-bio burger, but for a most wholesome and delicious experience you should go with the bio meat. With that being sad, the non-bio options are still better than the many burgers served around Neukölln, KReuzberg and Friedrichshain combined. If you plan to visit, have in mind the place is really tiny with a few high chairs and a small bar that comprise the interior. A few big tables are part of the exterior. Also, the place gets real busy and one needs to have the time to wait for burgers. It’s really not a fast food place, since the cooks take their time to bring a gourmet burger to you. I even heard about people coming from Hamburg just to get the good burger at BBI!!! Beers and the most popular soft drinks are on the drink list.